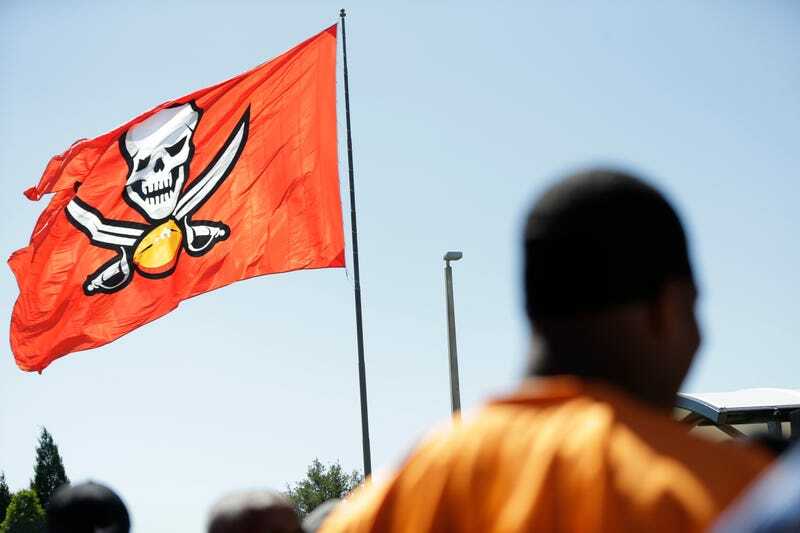 A North Palm Beach man was arrested after yesterday’s Giants win in Tampa, and police say he was attempting to set fire to the huge Buccaneers flag that flies over team headquarters. Daniel Justin Raboni, 32, was booked on charges of criminal mischief and possession of marijuana, one of which may have informed the other. According to the Tampa Tribune, he’s a Giants fan. Police say the flag is made of flame-retardant material, so it didn’t ignite and only melted a little. Good thing; that fucker is HUGE. The 80-by-50-foot, $26,000 flag hangs from a 15-story pole at the team’s headquarters. The story does not answer how Raboni allegedly reached the flag to set fire to it, if it was 15 stories up. Did he climb the flagpole? Was he shooting flaming arrows at it? Lots of questions here, not least of which is what the hell he’s wearing in his booking photo. According to the Hillsborough County Sheriff’s Office, Raboni remains in jail on $2,500 bond.